Each year in September, we celebrate Customer Appreciation Day, aka Zucchini Day. The tradition began a long time ago, as we found our veggie garden supplying us with a surfeit of zucchini squash. 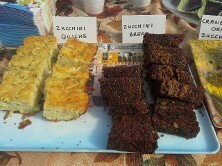 For Customer Appreciation Day that year we provided various refreshments all made with zucchini as a main ingredient. It was a success, and we have continued to explore the myriad possibilities of this wonderfully versatile vegetable. Below please find some recipes that will be useful in creating excellent zucchini dishes. 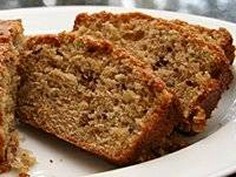 THE RECIPE IS OVER 100 YEARS OLD, NOT THE ZUCCHINI BREAD! Beat in sugar, then oil and vanilla. Beat until thick and lemon-colored. Stir in dry ingredients and zucchini. Turn into two well-greased 8" x 4" pans. Bake at 350 for one hour, or until pick comes out clean. 4 large eggs, farm fresh is best! Bake @ 350 degrees for 30-40 minutes or until golden brown.